Okay, maybe she did notice the quality of the stuffed animals, because she won a pink and blue teddy bear and had to ask what it was made of. Believe it or not, it was stuffed with Styrofoam pellets, or maybe even packing peanuts – not what you expect from your typical plush. Anywhere else, I could not see myself paying $12 for a hard lumpy bear, but the kid won it and she was proud of herself, so it was worth it. What was even worse is I chose to pay $8 for a lemonade! Talk about return on investment (for the seller of course). Half a lemon, a couple tablespoons of sugar, and lots of water costs maybe fifty cents to make, if you include the cup. Wow! I’m in the wrong business! 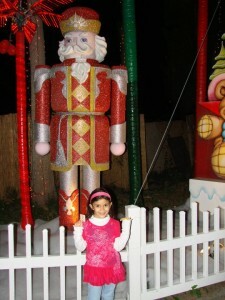 I can see why my husband adamantly refused to go to Santa’s Enchanted Forest this year. If you’re local, need a change of scenery, and have a couple hundred bucks to drop in one night, go for it. 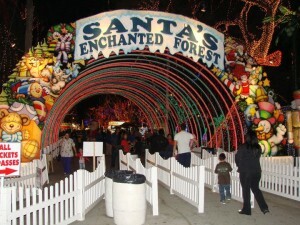 Keep in mind that seeing the lights from the freeway is one thing, actually going in is a totally different experience. 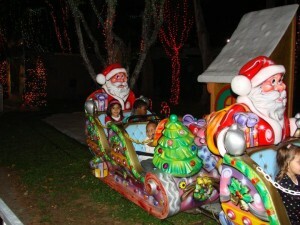 For out-of-towners, do you need to come here to see the world’s largest Christmas theme park? Well, the experience is definitely beyond compare, but not in a good way. Stay home and save your money so you can go to a real theme park. Don't worry, sweetie. Mom is taking you to Disney this year!